What is the goal and purpose of lifting weights? We all know the reason for lifting heavy weights is to cause our muscles to get bigger and stronger. But how does it happen? Every adaptation in the body is controlled by the Central Nervous System (CNS). In short, you can’t get bigger muscles or a deeper suntan or calluses on your hands unless the CNS has been stimulated in a way that signals your brain that you absolutely need that particular adaptation. The CNS is the ‘master switch’ that controls muscle growth. It measures stimulation and responds in proportion to the simulation. When it receives a signal that your muscles are taxed beyond their current capacity the CNS responds by placing your body in an anabolic condition that creates new muscle growth. About 13 years ago I created a CNS Workout. Even though people loved it, I retired the workout because it required granular tracking that took a lot of effort to get right and I didn’t have an efficient way to do it. But we’ve learned a few things in those intervening years. 2. Secondly, we developed the Engineered Strength Gym (ESG) to track the Alpha and Beta Strength used in each exercise and workout and to quantify the Volumetric Intensity of each exercise and workout. The ESG also tracks your personal rate of recovery based on your actual performance data. So I took a look at the old CNS Workout with fresh eyes. – What if we could adapt it to a better Power Factor Routine that was proven to deliver more gains? – What if we could track the exact intensity of every exercise – no matter how complex – to guarantee every workout is productive? – What if we could also calculate each trainee’s optimum recovery time for each workout to avoid overtraining and wasted effort? – And what if the workout could be closer to a full body routine that hit more major muscle groups to deliver maximum mass gains? This is guaranteed to be unlike any other workout you’ve ever tried or even read about. The Power Factor Compound Reps Workout is specifically engineered to deliver maximum muscle growth simulation.There is absolutely, positively no other workout like it. Soon you’ll be lifting the equivalent of a small parking lot of midsize cars in only three minutes of lifting. This workout is totally unique and innovative. The entire workout can be performed using a barbell inside a Power Rack or a Smith Machine, plus a leg press. You can even substitute the two leg press exercises for strong range squats and toe raises using the same Power Rack or Smith machine. So it’s an easy set up and the whole workout is over quickly because it involves only three minutes of actual lifting. Three of the toughest, high-output minutes your body can generate, under the strongest and safest conditions possible. We’ve been testing this workout with guys in their 20’s and even they find it to be very intense and demanding. It allows anyone, from beginner to expert, younger or older, to squeeze everything you have from the largest muscle groups in your body in quick succession. The indispensable condition for stimulating maximum muscle growth is forcing your muscles to perform the greatest amount of work per unit of time. So the Power Factor Compound Reps Workout combines exercises such as the Deadlift, Barbell Shrug, and Upright Row into one compound movement without rest. One “rep” involves multiple muscle groups. Your spinal erectors, glutes, traps, deltoids and biceps are all worked at their limits on the same compound exercise! Doing this the right way involves a lot of complex mathematical calculations that nobody wants to do. So the Engineered Strength Gym is going to do all of them for you. The result is the triggering of a massive anabolic growth response throughout your body. I can guarantee that your body will experience an unprecedented degree of stimulation. No workout, not even a grueling squat or leg press workout, can match the intensity of work performed by your body during the Power Factor Compound Reps Workout. The state of the art for measuring and tracking both the intensity of every exercise and the volume of every workout.Objective numbers mean you see your progress in black and white. The numbers do not lie – either you are stronger than your last workout, or you are not. 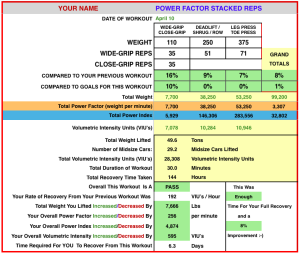 You’ll receive an analysis of every Power Factor Compound Reps Workout you perform. 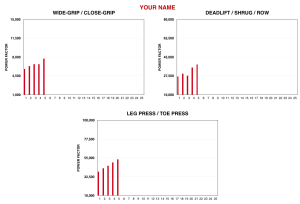 A graph show you you’re output power on each exercise. Your new goals and your next workout date are all calculate based on your individual rate of progress and recovery. This Workout is a Blast! Why? Because it’s unlike any workout you’ve done before. You force your body to lift the most weight it can without focusing on one bodypart at a time. So the endorphin release is fantastic. About an hour after you perform this workout many people get a feeling…a rush… of well-being and vitality that is just amazing. You owe it to yourself to use this new technology to kick your body into its maximum anabolic mode. It costs less than a bottle of supplements and it can be delivering results starting with your next workout. Really! 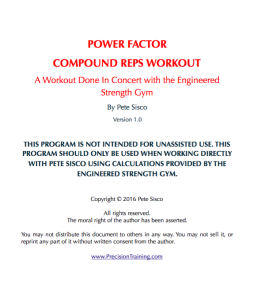 Download the Power Factor Compound Reps Workout right now, head straight to your gym to try it out. Month to month, no commitments. Train with the Power Factor Compound Reps Workout as long as you like, quit at any time, with no notice, effective when you say so. No worries: You’ve got my iron-clad 100% money back guarantee! Month to month, no commitments. If you don’t like the program, you can just tell me and I’ll refund your $37. Our business is helping you build new muscle as efficiently and effectively as possible. And with objective measurement every step of the way you’ll see we deliver what we promise on every workout. What could be more fair than that?